Liberating Inner Eve tackles the many perspectives Christians have on the story of Eve. What was your inspiration that made you want to write this book? What inspired, or more accurately, “compelled” me to write “Liberating Inner Eve” were a couple of influences that crossed their paths during my life’s journey. One was my ongoing professional dedication to nurturing high levels of confidence and self-love in my clients. Part of this calling always involved being aware of the many factors that restrict their experience of high self-worth, including those less obvious such as layers of historic conditioning (for example those relating to women being less encouraged to pursue self-development outside of their caring roles (than men)). Another influence that inspired me to write “Liberating Inner Eve” was my journey as a mother. When introducing my son to characters from Bible stories, I found myself being very mindful of the messages that society’s common interpretations of popular Bible stories (like the account of Adam and Eve) continue to send to our future generations. For example, the popular depiction of Eve as Adam’s helper in many of today’s children’s Bibles often falls short of placing enough emphasis on Adam and Eve’s calling towards a complementary, mutually supportive union, as interpreted by JPII. In every chapter of “Liberating Inner Eve” I decided to explore a theme that I frequently address as a counselor, presenting it as a holistic marriage between cultural, historic, and psychological influences. And pair it with those strategies that I found to be most effective in helping to transform it, so it resonates with the Gospel’s message of inclusion and empowerment. I wanted to write “Liberating Inner Eve” from the heart, sharing my own journey of transformation with my readers, as well as the lessons I’ve learned from having the privilege to listen to so many female voices. What do you find is a common misconception people have about the Genesis account of Adam and Eve? As a counselor I appreciate the power that visualization has in stimulating the various sensory pathways and emotional patterns within our brains. There is much written about the power of visualization and metaphors in influencing our subconscious mind. What I love about the Bible is the way it abounds in metaphors and analogies that describe not only the nature of the Kingdom of Heaven but also the many aspects of our humanity. What I find most concerning about the common interpretations of the account of Adam and Eve, that is the ones that imply in some way that Eve is the more inferior of the original pair, is how this emphasis has been represented in art throughout history, as well as how influential it was in the forming of subsequent theological reflections and practices. I feel that Adam and Eve’s calling towards a complementary, mutually supportive union (as interpreted by JPII) and her release from blame for mankind’s downfall (which I address in “Liberating Inner Eve”) needs a lot of reinforcement. So that in the midst of today’s “movement of equality” we can prevent many women from turning away from the depth and beauty of Christian spirituality, because of these and many other historic/social misconceptions. I found this to be a soothing book that also serves as a guide to self reflection. What do you hope readers take away from your book? My aim for “Liberating Inner Eve” is to raise awareness in relation to the many historical/social pressures and restrictions that impact on women’s experience today (as awareness is the first step towards transformation). I would also like to offer tools that empower women to manifest Christian values of equality, freedom, and mutual care in their life’s unique circumstances. 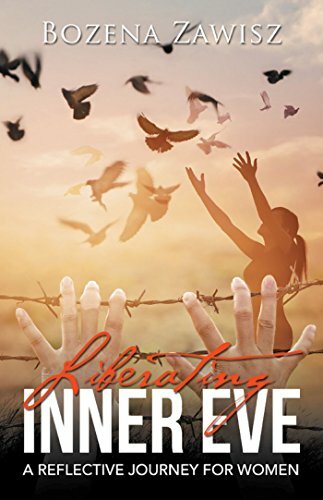 I wrote “Liberating Inner Eve” as a result of my encounters with female clients from a Christian background who struggle to find a sense of personal strength, high self-worth, love, and acceptance. “Liberating Inner Eve” offers psychological insight around the impact of commonly found interpretations of the teachings of the Old Testament (in particular the Genesis account of Adam and Eve) and New Testament (the lifetime of Jesus), on various themes relevant to women’s daily lives, such as how they experience their identity, self-acceptance, and self-worth. Every Chapter of this book includes simple exercises, encouraging readers to take time to review their thoughts and feelings, relating to a particular topic. Through “Liberating Inner Eve” I long to share with others how empowering the Bible can be in helping women find self-love, self-acceptance, and personal strength. Posted on March 18, 2018, in Interviews and tagged alibris, author, author life, authors, bible, book, book club, book geek, book lover, bookaholic, bookbaby, bookblogger, bookbub, bookhaul, bookhub, bookish, bookreads, books of instagram, booksbooksbooks, bookshelf, bookstagram, bookstagramer, bookwitty, bookworks, bookworm, bozena zawisz, christian, confidence, ebook, empower, goodreads, gospel, heaven, humanity, ilovebooks, indiebooks, kindle, kobo, Liberating Inner Eve, literature, mother, nook, novel, psychological, publishing, read, reader, reading, self help, self love, shelfari, smashwords, spiritual, story, woman, women, writer, writer community, writing. Bookmark the permalink. 1 Comment. Ever hear of Theology of the Body? You should check it out…I think you might find it very interesting. It’s all about what Genesis reveals to us about what it means to be men and women.